cAir® 2-week contact lenses offer everything your patients love about Avaira® and more. Ultraviolet (UV) radiation can be harmful to eyes, with the potential to cause cataracts and other damage.6 That’s why cAir offers Class 1 UV protection that blocks more than 90% UVA and 99% UVB4 offering greater protection for your patients’ eyes. The third generation of silicone hydrogel material used in cAir is inherently wettable with no surface treatments, and uses naturally wettable building blocks to improve compatibility between silicone and hydrophilic domains. This, combined with the higher water content of cAir ensures a high performing, comfortable lens. Hydrogel contact lenses minimise or eliminate hypoxia-related signs and symptoms during lens wear. cAir contact lenses have excellent fitting characteristics, making refitting Avaira patients simply effortless with no additional chair time. 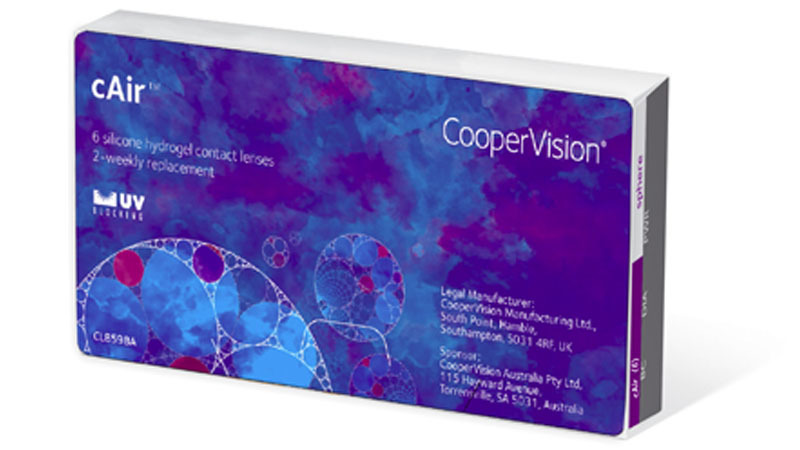 Offer your patients the excellent performance and superior comfort1 of cAir contact lenses. The advantages are effortless.